Thanks to Veterans’ Day, I have managed to take a long weekend trip away from Southern Maryland. I’m currently in Berkeley Springs, West Virginia. I’ve enjoyed the historic and ever constant 74 degree spring that George Washington and many other Virginia notables visited for its healing properties. Even when on vacation though, I’m always on the lookout for anything assassination related. At a local antique mall I looked through every single CDV and cabinet card they had looking for a familiar face but to no avail. I did find and flip through the 1938 issue of Life magazine which contains pictures of the Booth mummy, but decided against purchasing it. 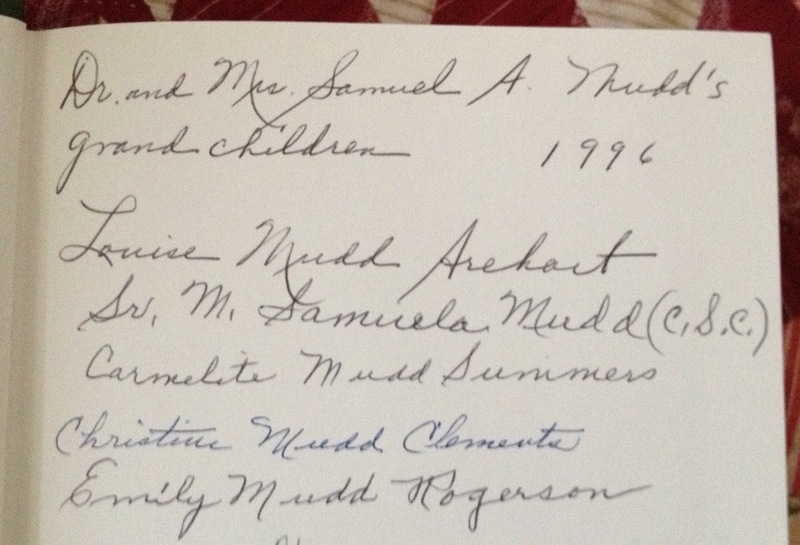 Sadly, all of those who signed this book back in 1996 have all died, with the last granddaughter, Marie Mudd Summers, having passed away in January of this year. While not quite a collector’s item (I believe the Mudd House still sells autographed copies too) I feel the personal connection that comes with this book is worth purchasing an extra copy of it. Moreover, I was impressed to find a little piece of my local Maryland home 130 miles away. Did you arrange to meet Ed Steers? He lives just outside the heart of downtown. Check my history, but I think the Berkeley Castle was built by a native of Prince George’s County, Maryland, and finally, make sure you eat crab cakes at Tari’s — some of the best I have ever had, and that’s coming from a Southern Marylander. In the summer, there’s a great place for homemade ice cream. We’re actually at Tari’s right now Laurie. We already ordered though and didn’t get the crab cakes. Next time. Also I didn’t know Dr. Steers lived here. Had I know we certainly would have invited him and his wife to dinner. Again, next time. Right after you told me this, Laurie, I knew you were right. Not only did the Berkeley Springs bookstore have this signed Mudd book, but also Ed Steers’ His Name is Still Mudd. You can’t find that book in most places anymore so it makes perfect sense that it would still be in his local bookstore. They also had the Assassination Encyclopedia and Blood on the Moon, too. 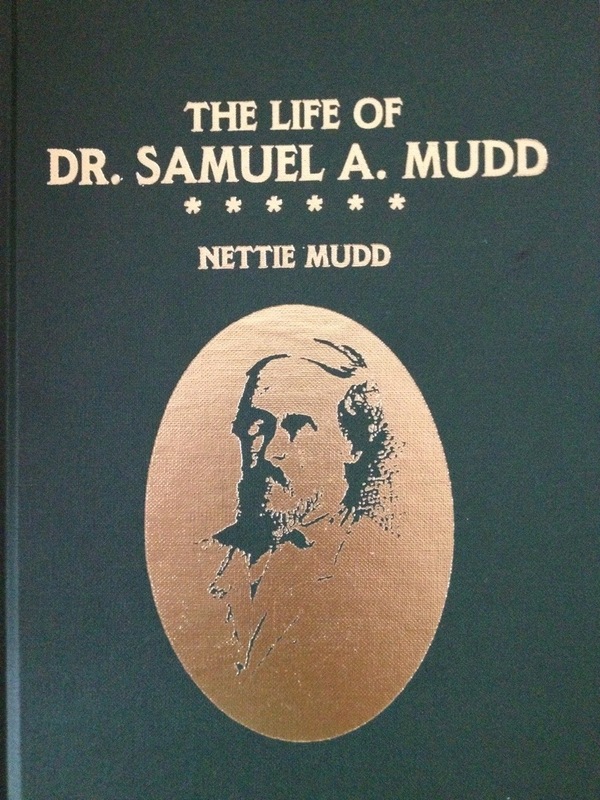 In 1980, when my wife and I visited the Mudd home, I purchased a copy of Nettie’s book. It is signed by 12 grandchildren beginning with Christine Mudd Clementa and ending with Dr. Richard D. Mudd. The edition I have has a brown cover. After purchasing the book we embarked on a pleasant tour narrated by Louise Mudd Arehart. Near the end of the tour I mentioned I was an American history teacher who conducted a yearly mock trial with my students. I noted that some of the students questioned the beard story, and that I also had my suspicions. This was not said in a belligerent manner; rather I was simply interested in hearing the family’s side of the story. In my own mind, I meant no harm. However, the result of bringing up the topic was an abrupt end to the tour. We were firmly and briskly led out the door. So what had been a pleasant tour ended on a sour note. It is something we’ve never forgotten. My wife, who said nothing and has no interest whatsoever in the Lincoln assassination, still recalls it as clearly as I do. From what I understand Roger, most folks in the field see being kicked out of the Mudd house as a rite of passage. So wear it like a badge of honor, my friend. Funny about the abrupt end to Roger’s tour of the Mudd house. The tour my wife and I took ended when I pointed out, in a non-confrontational way, that the photo of “Lincoln” in the little museum was of another bearded man, not Lincoln. It may be different there now. When Patty and I visited, the tour was given by Dr. Mudd’s grand-daughter, as astonishing as that sounds. I’m sure that she’s no longer giving tours, if she’s even still with us. But since she was somewhat testy, I didn’t buy any of her crochet work in the gift shop!! !